Preheat your oven to 375ºF and generously grease a 6-well donut pan. In a mixing bowl, blend the coconut yogurt, eggs, sugar, lime juice, coconut milk, and lime zest until frothy. Stir in the coconut. Sift the flour, starch, baking powder, baking soda, and salt. into a bowl Gradually stir the dry ingredients into the wet until just combined. Fill each cavity in the donut pan with ¼ cup of the batter and bake for 15 minutes. Run a knife around the edges of the donuts and remove them to a wire rack to cool completely. Place the coconut milk into a saucepan and warm it until just shy of a simmer. Turn off the heat. Stir in the chocolate chips and lime juice. Whisk until smooth. 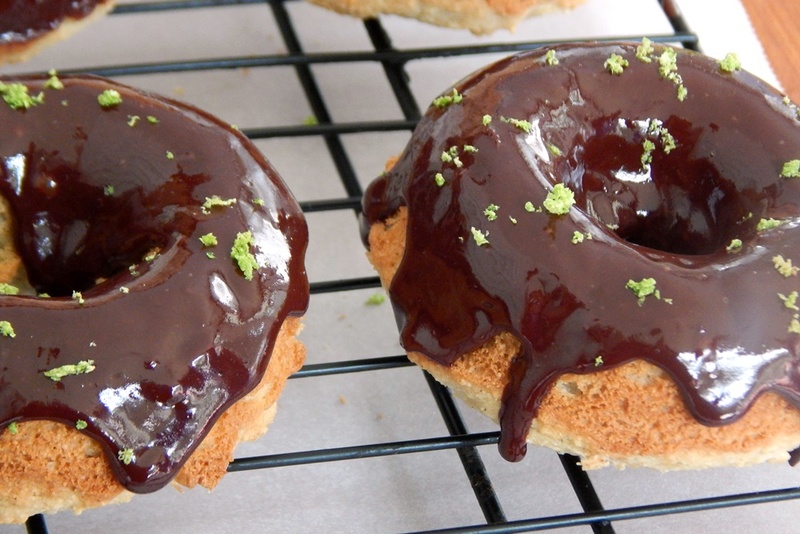 Either dip the top of the donut in the chocolate glaze or use a spoon to cover the top of the donut. If desired, you can double dip the donuts in the glaze (hey, this may be the only time that it is okay to double dip). Sprinkle with lime zest. Allow to set. To speed setting you can place the donuts in the refrigerator until the glaze is set.